in the first activity i have a mapview and when i start a second activity, then i go back to first activity and click on the mapview. 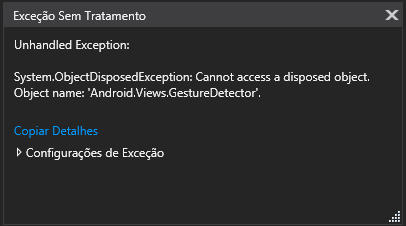 The application show a exception. We hadn't met the same exception before, and from your exception call stack, you can see it's not from our code. Today we tested some of our Android project, but hadn't reproduce it. So could you please build a simple sample to reproduce it? Our developer can research it based on your sample.